A lucky local mother and daughter will win a day of rest, relaxation and pampering at Joseph Anthony Retreat Spa and Salon. Comment by 9pm Saturday, April 23rd, 2011 for a chance to win! Mother’s Day is right around the corner. A great treat for mom? A mother-daughter day at the renowned Joseph Anthony Retreat Spa and Salon in Glen Mills that will be an experience to cherish together forever! 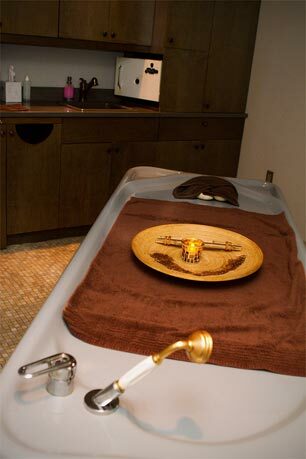 Choose from a facial, specifically designed for your skin type or a Swedish Massage. Each of you will also enjoy Alpine Hay Treatments, Brine Light Therapy Treatments, wash and blow dry, make up application, complimentary beverages and a special gift! This Mother’s Day, surprise your wife, girlfriend, mom or daughter with this incredible prize. It’s a true retreat from the everyday with the wonderful team at Joseph Anthony—be prepared to be pampered! This prize is valued at approximately $500. Anyone can comment here to enter to win this giveaway-but the spa experience/day is for a mother and daughter only. Surprise the favorite mother and daughter duo in your life or your own mother, or daughter, by commenting for a chance to win! How to enter. Leave us a comment below by 9pm Saturday, April 23rd, 2011. A winner will be drawn randomly after the close of the giveaway with the help of random.org! Address: Joseph Anthony Spa is located at 243 Baltimore Pike, Glen Mills, PA.
To purchase Joseph Anthony gift cards for Mom for Mother’s Day call: 610-459-4663 or click here. I think this is just what the doctor ordered. Would love to win this and take my MIL. I would die if I won this. I don’t get to see my mom much, across the miles. She’s my best friend and has never been to a spa. She’s helped me get through a very difficuly time with my health in recent years and would love to give this to her ! She’s visiting in may which would be perfect. Thanks for letting me enter. My Mom deserves this lovely gift! Great salon and Kimberly gives a heck of a great pedicure! This would be the perfect mothers day gift, my mom would love this! Hope I win–would be a great day with my mom! I would SOOOO love to win this :) Thank you!! I absolutely love Joseph anythony salon .. Im going there Saturday with my mother and would love a chance to go again and treat her for an early mothers day, much needed, relaxation day. All the staff is super nice and friendly and they do a great job in everything they offer (although I have only tried some because of budget constraints)!!!! hope I win!!! This sounds AMAZING!!!!! I just don’t know if I would want to bring my Mother or my Daughter!!!! lol!!!!! I just had a baby 5 weeks ago, and my mom has been an AMAZING support system for us. I would love us to spend this very special Mother’s Day (my first as a mom, her first as a grandmother) doing something special like this. Plus, she lives in Glen Mills = perfect!! My wife works hard as CFO of a company, volunteers at our kids schools, and volunteers to provide guidance to our local government. My teenage daughter volunteers through National Honors society, acts in the school plays, takes 3 AP courses and is a straight A student. Neither of them does something for themselves very often. I would love for them to have a relaxing day to enjoy together. would love to surprise my mom with this! would love to treat my wife & mother to this. I would love to win this! It’s my parent’s 39th wedding anniversary is on April 22nd so this would be a great gift for her! My mother is always sick and in and out of the hospital. She has akways been so selfless and giving. It would be amazing to treat her to a beauty day at one of the top salons in the area. We would have such a wonderful experience, which we would forever remember. Ooooh . . . my mom’s coming to town right after Mother’s Day–would love to be able to give her this! Thanks! Sounds like just the thing both my daughter and myself would enjoy completely! Wow! Sarah, you are doing such a service to the community! Just thinking about this prize is filling me with glee! Winning it would be over the top! This is soooo needed for my mother and me!!! She totally deserves it, being the best mom ever~!! My mother absolutely deserves this spa day. She constantly takes care of others instead of herself – from me, my brother and father; to my grandparents on my father’s side; to her deceased brother’s widow and children. She’s has the heart of an saint – I’d love to be able to give her this relaxing day! My daughter and I celebrate our bdays this month just one day apart! What a great gift to each other!! I haven’t seen my mom for 6 months — she lives out of state. She’s coming to visit in a few weeks, and this would be an awesome way to spend quality mother-daughter time together! My daughter lives in another state, and we don’t get to see each other often. I would love to surprise her with a day of pampering at the Joseph Anthony Retreat Spa and Salon. Normally on Mother’s day she also makes a wonderful book of puictures of family events from the past year. i’ve loved my ecxperiences at Joseph Anthony and I’m sure my mom would, too. My Mommy more than deserves a day of relaxation! Would love to spend quality time w/ my mom at the spa! OH how my mother and I need this right now! Fingers crossed! Ps. what a great giveaway! WoW! this would be a awesome day out for my daughter….Hip Hip Hooray for Joseph Anthony…..
My mom and I have been working so hard keeping up with our family business, all we do is work and talk LuLu – it would be nice to get away for a day to just enjoy each other rather than talk about deadlines and sales and business !!! Would love to give this to my wife for her and her mother. My wife works full time and we have 3 kids, so my mother-in-law picks the kids up and watches them 3 days a week. I think they both could use a day away. My mom would love this treat and so would I! Pick me, please! Thank you! Wow. Keeping my fingers crossed. Can’t think of a better way for some excellent mother/daughter bonding. Would love to send them to Joseph Anthony’s for some well-deserved pampering. My mom and I would love love love this…I really hop ;) I win!!! My mom and I would have such a great time! I’m ready for some pampering! Here’s hoping! What a fantastic Mother’s Day gift this would be! My soon to be (on May 29th) 92 year old mother lives with me. Although she is of “sound mind” her spirits are sometimes low because many of her friends and relatives are no longer with us. What could brighten up her day more than a “day of beauty” with her favorite (and only) daughter. It would certainly lift my spirits also! I would love to do this for my mom! This would be a great gift us, its been tough times in our family. My mom never takes any time for herself – this would be a great way to force her to pamper herself for a day! My mom and I would love this especially after the tough year we have had! My daughter and I would love to celebrate her 22nd birthday and new job (in this economy :-) with a mother-daughter spa treatment. Ruth L.
What a wonderful way to spend mother’s day! I would love to win this gift for my mom. What a lovely idea. My daughter would be so thrilled. She keeps asking me to take her for a mani/pedi this would be perfect. Any mom is deserving of this prize – but I would love to celebrate my mom, Roberta, on this mother’s day! I’m getting married this June and it would be the perfect opportunity for us to spend some quality time getting pampered – together! My daughter has been hard at work putting her October wedding together. She has just changed jobs, and is a full-time realtor now. She chould use a break, and this would be just the ticket to de-stress! We’ve always wanted to do this together. This would be such a treat after a long couple months. Best giveaway ever! Thank you! Winning this would be a dream come true. My mother has to attend to my disabled sister full-time, so we rarely get to spend time together and she never gets a chance to be pampered! I know of this spa from driving by it and it looks like a great end-of-winter treat to win this great prize! My mother would be thrilled, she has spent countless years taking care of her parents. She needs to be taken care of for a change and shown how appreciated she is. I’d love to be able to take my mother and do something special, what a great giveaway! Would LOVE to share this with my mom!! My mother has been a caregiver to her parents and Uncle, who have since passed away. She is currently caring for my Aunt who is going blind. This would be the perfect gift for her for Mother’s day. She is never able to enjoy time for just herself and be pampered. What a great give away!! This would be fun with Mom! My mom would love this! My grandparents died a month ago and within 3 weeks of each other. This would really make my mom’s day! My Mom and I would really enjoy trying Joseph Anthony Retreat Spa!! Thanks! I would absolutely love to win this prize to share with one of my daughters. We all work very hard with our Girl Scout troops here in Havertown, and my oldest daughter is very active with the Junior League of Philadelphia. It would allow us some quality time together. Same daughter is having a horrendous time locating a full time position since graduating from WCU (but haven’t we all? ), and between the job searching and her volunteer involvement, I think this would be a great way for the 2 of us to spend mother’s day. I hope you pick my entry as the winner. My Mom is my best friend and talk to her twice a day. She currently takes care of her Mom as a full time care giver and this would mean the world to her to have a day of relaxation and spend the day together. Would so love to win this giveaway and surprise my mom. She’s never said no to anything we’ve ever asked of her! Sounds like a great way to spend a day with my beautiful daughter! After the passing of her mother, my mom could sure use a break from reality now. This would be a great chance for her to rejuvinate her spirit. This would be an amazing surprise for my mom! She is always around to help out with my two young kids and never asks anything in return. Plus I’ve been dying to try it myself! I’ve heard amazing things about this salon! Sitting in bed with a terrible cold and 102 degree temp. A spa day for mother’s day would be wonderful! This is a special treat… what a wonderful way to do some mother/daughter bonding!! My mom could definitely use some TLC right now and this is exactly what the doctor ordered. great giveaway… have never been – would love to go with my mom! my mam will be here from ireland on the 29th for two weeks,would love to win!! I would LOVE to be able to do this for my mom! She has never been to a spa. What a great giveaway!! After being pregnant for the last 2 years (just had my 2nd march 8th–babies are 14 months apart) this would be an amazing day to share with my mom. It’s definitely well needed!! Sounds wonderful! Would love to win! My daughter and I would love a day of pampering. What a great way to show my mom how much I appreciate everything she does for me. And…it would be such a great kick-off to my pre-wedding festivities! My would love this! Would love to win and be able to surprise her! I am due to have my second baby right around mothers day, and it is also around the time of my own mom’s birthday. I would love to be able to treat my mom to a day of relaxation. She does so much for me. And my family, and will be helping even more once new baby is here! My daughter just graduated with her Masters degree and I have been working really hard selling real estate. We both could use a bonding day of relaxation!! I would love to win this and surprise my mom. She does so much for everyone else and never takes time for herself. This would be the perfect treat! THis would be a perfect retreat from a long winter, and a great way to spend time w/ mom! Joseph Anthony Spa has been kind enough to donate a few salon packages for different fundraisers my mom and I have planned for the Domestic Violence Center of Chester County. My mom is the Director of Development at DVCCC, so she spends majority of her time supporting and taking care of others. We’ve never had the opportunity to experience a salon day together, so it would definitely be a special treat! What a wonderful idea! As a mother of 3 very young children I appreciate my mother more and more every single day! I think Mother’s Day should be a national holiday and all mom’s should have an entire week off!- or maybe just 1 day! I love this salon, and would love it even more if I won!! My mom is SO deserving of a spa day – she’s naturally gorgeous but she could always use some pampering. We’ve been looking to find some mother-daughter time, so this would be amazing! My mother is 85 years young. She is very active and VERY much into taking care of herself and her appearance. I would LOVE to be able to give her this gift for Mother’s Day! Spending a day with just the two of us focusing on just the two us would be heaven on earth! BTW – I went to my first Around the Mainline event during restaurant week on the Mainline. I am so happy I joined the group. It was a great evening! Thank you. The best spa in the area for pure pampering! Stress is my middle name. I could sure use a day at the salon. I’m going to be a mom for the first time on June 7th and I would love to have a spa day with my mom! I’d rather win a Mother non-duaghter spa trip! I love my 2 year old but could use a break! Would love to treat my mom to this! Love your spa! I always recommend it. Would love to treat my mom. Mom and I love massages! She would love to be pampered. I would love to try the spa with my daughter-in-law! I would love to be able to treat my Mother to this. It would also give us a chance to get in some good quality time together. Since we have not had that in a long time. I love my Mom! My mom would love this and most definitely deserves it! Wishing on a star for this heavenly treat. This is an incredible prize. I would love to win! Thanks! This is great. I would love to take my mom! What a wonderful idea! What mother/daughter pair wouldn’t be grateful to win something so awesome? Thanks for the opportunity! I have the BEST mom in the world. I would love to be able to give her something to celebrate her. She really deserves a day of pampering and relaxation!! Winning a day to spend with my teen daughter would really be special, a nice day of bonding! And a this lovely spa… even better! Man, I could use some pampering. I would love to win this for my fabulous mother!! My Mom and I would SO love to spend the day at the spa. We don’t live near each other so a little mommy/daughter time would perfect! I can’t think of anything mom deserves more! My mom and I would love to get a day of pampering! She was just laid off from her job and some relaxation would be perfect in this stressful time. Working all day, long hours….just what my mom & I need…pick us:) Happy early Mother’s Day to all of you Moms! I can’t think of anyone more worthy of being treated like a queen than my mom. Widowed at 39 with six children, raised us all, breast cancer survivor, one of the most loving and giving woman I’ve ever known. She wouldn’t know what to do…but I’d love to see her being treated like she deserves. My mom suffers from Rheumatoid Arthritis, and a slipped disc. She is constantly house ridden, and depressed because she’s unable to do anything for herself due to her constant discomfort and pain! She does so much for others, but never for herself. I would absolutely LOVE to pamper her and I know that she would enjoy spending this special day with her only child. Sounds like a perfect day to spend with one of my daughters! My wife is a first time new Mom to our beautiful 4 month old daughter…She is an amazing Mother who is selfless in every way, sacrificing so much for our baby and for me as I just made a career change. I work 2 jobs and she cares for our daughter without any relief or assistance, never muttering a complaint. She and my mother have gotten very close over the past year and I would love to see them, especially my wife be pampered…There is no one more deserving for her first Mother’s Day! Thank you, good luck everyone and Happy Mothers Day to all of you! What a fantastic giveaway! Sounds wonderful! Wow, this is great!! Nice Mother’s Day gift…. I love Joseph Anthony’s and the staff is amazing… Would love to win this!!!!! Any reason to spend a day with Mom would be lovely! Would love to try this place!! Fingers crossed for my mom and I! Amazing spot! I would love to send my mom and MIL for a really special Mother’s Day treat! what a lovely giveaway – good luck to us all! I’d love to do this with my 85 year old Mom! What a treat this would be – for both of us! Omg do my mom and I need this! We are both so busy and hardly get any quality time together but I’m guessing we could both clear our schedules for this! this sounds like a special day at a special place, and a great memory to be shared! What a great giveaway! Would LOVE to win! Thanks for the opportunity! This would be wonderful to do with my teenage daughter–or maybe with my mother-in-law instead. Either way, what a great mother’s day! I would love to win and would invite my daughter to join me! This would be great…my mother is visiting for 2 weeks, including mother’s day. My father has been very sick, and it would be a great treat for both of us.